First edition paperback - Wine Making Series No. 1, published by Heidelberg Publishers Ltd, London, in 1971. 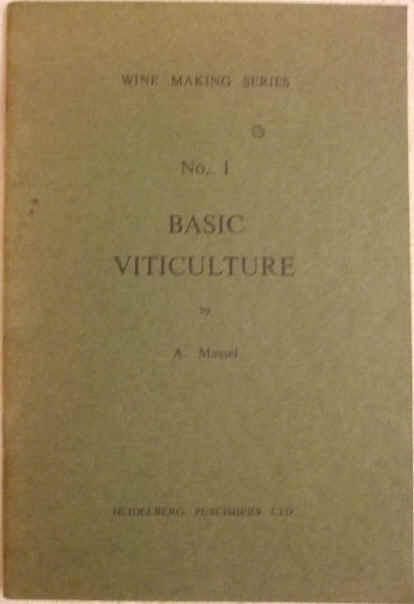 First edition paperback of BASIC VITICULTURE - Wine Making Series No. 1, by Anton Massel and published by Heidelberg Publishers Ltd, London, in 1971. The book is in very good condition with clean dark green card covers and black lettering on front. There is slight fading to the edges and around the spine, two small stains on the front and very slight peeling at the bottom edge at the back. Internally, the pages are clean and tight and there are no tears and no inscriptions. A basic guide to vine growing. Anton Massel came to England in 1956 from Germany as a qualified oenologist (Ingenieur grad.) to take charge of the service laboratory of the then Seitz UK agents in London. Seitz are the famous German manufacturers of wine handling equipment, the pioneer of wine filtration and cold sterile bottling which has become the standard procedure for quality wines. In 1960 Massel established his own laboratory in London and he introduced a number of modern winemaking practices, and better equipment. Until the Wine & Spirit Education Trust was founded in 1968 he also organised lecture courses on viticulture. In 1969, as part of the activities of Club Oenologique Ltd., a wine appreciation club, he organised the first International Wine & Spirit Competition (IWSC). 45 pages. Illustrated with black & white line drawings in the text.